Will lightning strike twice for the creator of surprise hit Q-Shi? Ray Aker is a man on a mission. He is a consummate restaurateur, a professional who enjoys pleasing guests and creating restaurants that serve the community and fill a need. We were skeptical when we heard about Ray’s first concept, Q-Shi, but one visit won us over, and made us fans. Rumblings about a new concept in the original (but remodeled) Q-Shi location had us intrigued; a phone call from Ray asking us to come check it out resulted in a quick trip down I-45 for a first look. We’d made the drive to the original Q-Shi location many times, including once for the filming of Diners, Drive-Ins and Dives with Guy Fieri. Upon pulling into the suburban strip center, we parked right beside the building. You can’t miss it. The outside of the building proudly wears the new Qomfort branding, proclaiming the availability of breakfast and lunch for the community. As always, parking is easy and ample. Walking inside the building, we were impressed by the changes. 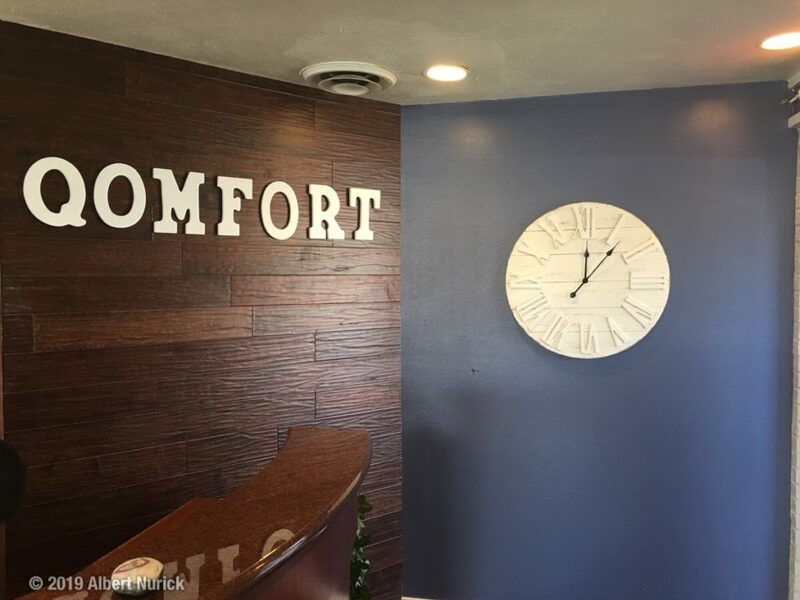 The look of the space has been freshened and brightened, and an inviting hostess station greets guests as the walk into the space. 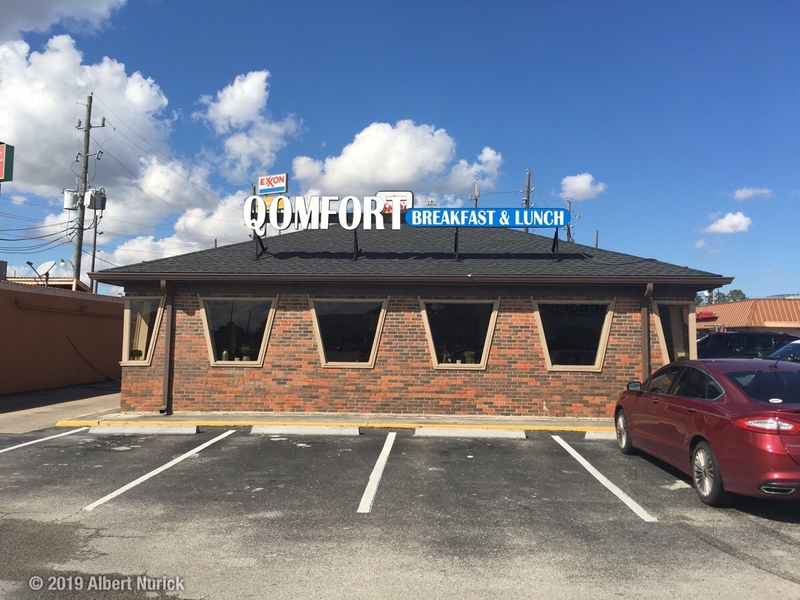 Qomfort opens at 6:30am, providing a quality alternative to fast food for morning commuters, and closes at 2:30pm, after the lunch crowd. The menu is a tightly edited list of breakfast classics and speciality dishes. The specialities are interesting and outside of the box, as you’d expect from one of Aker’s restaurants. They’ve tapped Chef Jonathan Branch to head the kitchen; Chef Jon has a broad culinary background, most recently as chef at 55 Degrees Wine Bar in Houston. We sampled a few different items. First up is the grab-and-go option, a breakfast wrap. 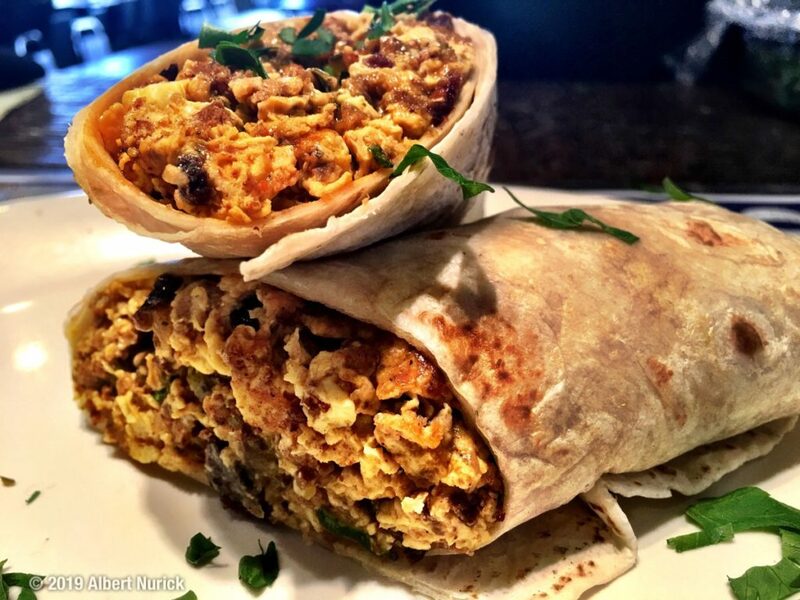 This substantial handful was a large flour tortilla, wrapped around chorizo, potato, and scrambled eggs. The wrap was very good; the house chorizo brings a lot of flavor and a gentle, slow heat. Wraps are build-your-own, and you have all of the traditional breakfast meat options, along with several veggies. Next up was a Southern classic: Shrimp ‘n’ Grits. 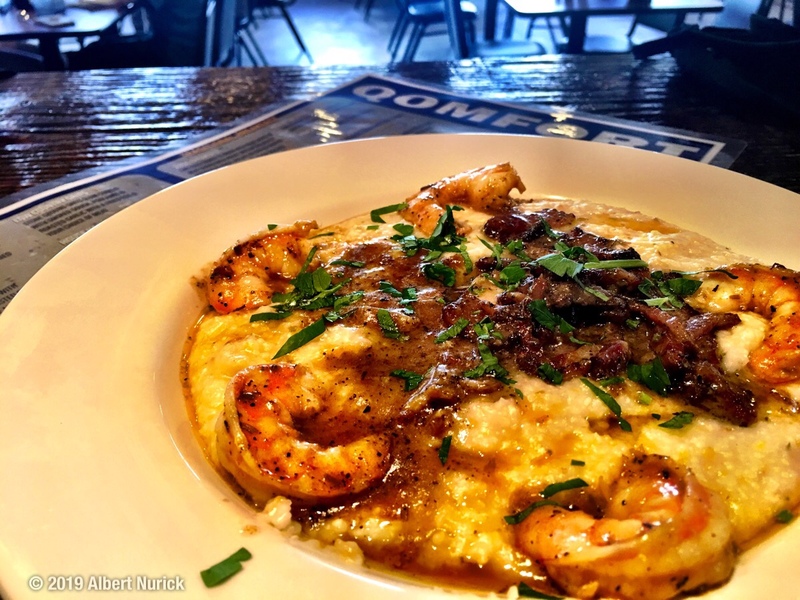 Stone ground grits are slow cooked with smoked gouda, poblanos and roasted garlic, then finished with a housemade creole sauce with crumbled andoullie sausage, bacon, and nicely sized shrimp. The flavors of the bayou come through loud and clear: Smoky, rising heat, creamy, smooth, and delicious. Perfectly cooked shrimp and beautifully textured grits complete this dish, and the result is a Southern classic we’ll be ordering again. The final dish came highly recommended. 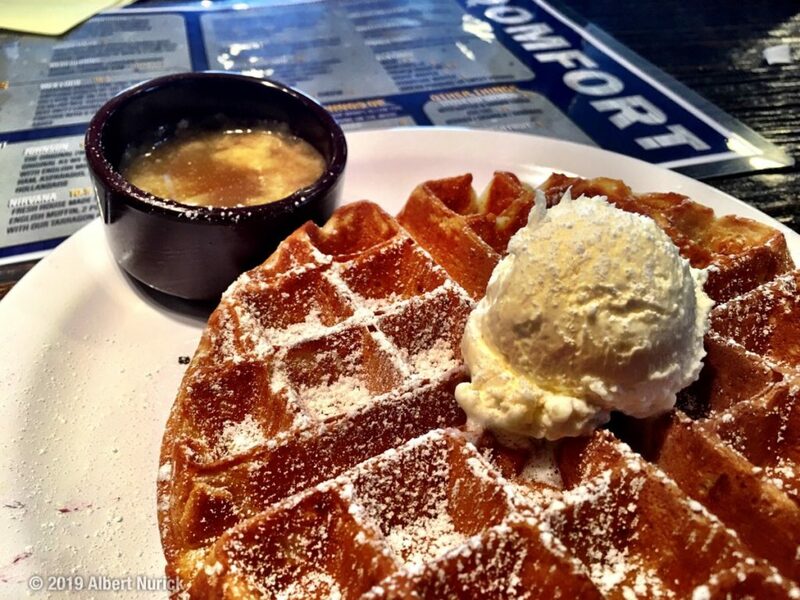 The Qomfort Signature Waffle, made with Chef Jon’s Bread Pudding batter. Deceptively simple, it came topped with butter, and served with housemade Butter Maple Bourbon syrup. The light, fluffy waffle was outstanding; the complex sweetness of the bread pudding was an outstanding variation on this breakfast classic. But the magic happened when the Butter Maple Bourbon syrup was added; the result was lush, rich, and utterly decadent. It’s the least expensive trip to the Big Easy you can take on a typical Houston morning. We had high hopes for a new restaurant with Ray Aker’s name attached to it; fortunately he and Chef Jon adroitly exceeded our expectations. 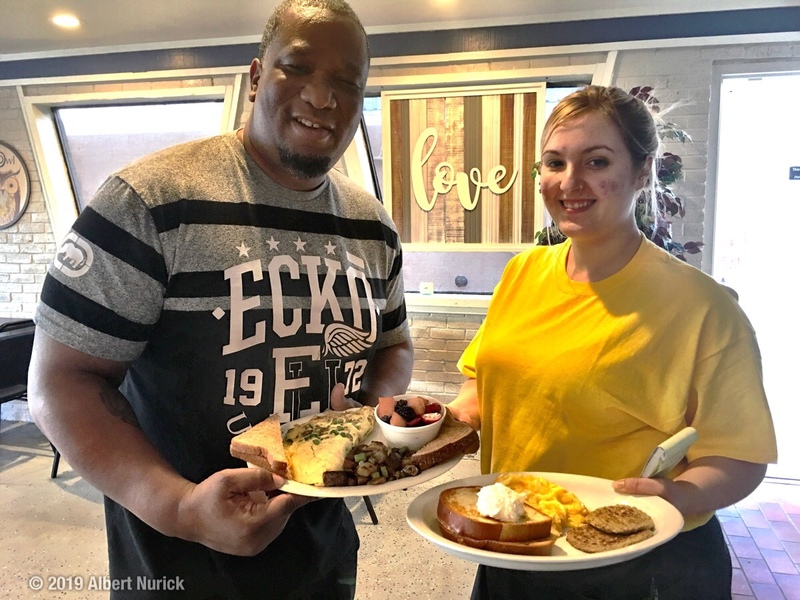 We’re delighted to have a new, great option in the Woodlands area for breakfast, and look forward to returning soon and exploring some of the lunch options as well.